Twist On/Off Cover— No More Bolts! The LVD-800 Series fail-safe bin monitor is the state-of-the-art in rotary paddle technology. Utilizing magnetic sensing technology and a unique housing design, the LVD-800 Series fail-safe bin monitor is the most reliable, technician-friendly, rugged and economical truly fail-safe rotary paddle point level control sensor of its kind. The LVD-800 Series fail-safe bin monitor provides the ultimate in performance wherever critical continuous operation must be ensured. Detection of both material presence and its own operational status is performed on a continuous basis. 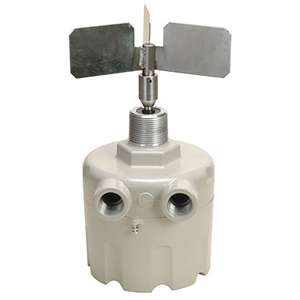 The LVD-800 Series fail-safe level sensor monitors its electrical and mechanical operating condition. This, in conjunction with separate outputs provided for material sense and unit status (fault conditions) makes this unit a "truly" fail-safe device. While the LVD-800 Series fail-safe bin monitor is an evolution in rotary paddle technology, it continues to use tried-and-true operating techniques. Unlike many other available units, the LVD-800 Series incorporates a feature that automatically shuts off its motor when the paddle is in a stalled condition. This extends the life of the unit and minimizes maintenance. The operation of the LVD-800 Series rotary paddle fail-safe bin monitor uses magnetic sensing technology to detect both material presence and operational status of the unit. This method is simple and more reliable than that used by other manufacturers. The unit is installed through the wall of the vessel so that the paddle protrudes inside the vessel. A small electric motor drives the paddle, which rotates freely in the absence of material. The built-in microcontroller performs self-diagnostics and monitors both shaft and motor mounting plate rotation. This allows the unit to easily distinguish between material presence and any electrical and mechanical failure of the unit. When material presence is detected, the SENSE relay changes state and the drive motor is deenergized to extend motor life. This output is available to control a process function or alarm circuit. When the material level drops, a tension spring returns the drive motor to its original running condition and is reactivated. The rugged and reliable design of the LVD-800 Series fail-safe bin monitor makes it the best choice for critical level control applications. The unit is compatible with many granular, pelletized and powder bulk applications. It can be utilized for high level indication of materials over 160 kg/m³ (10 lb/ft³) and for low and intermediate level indication for materials over 80 kg/m³ (5 lb/ft³). The LVD-800 Series bin level monitor can be installed almost anywhere dry bulk materials are stored including bins, hoppers, silos and tanks. Please see the Material Characteristics Guide for assistance in determining the compatibility with the LVD-800 series. For optional 24VDC, add suffix "-24V" to model number, (available on the LVD-803 only), add $30 to price. For optional high temperature version up to 750°F for SS (top or vertical mount only), add suffix "-HT" to model number, add $300 to price. * Insertable paddles eliminate the need for mounting plate. LVD-800-1VS is insertable through either a half or full 11/4" coupling, that is welded to the bin wall. LVD-800-1V is insertable through a half 11/4" coupling. * Shaft guards are required for use with solid shaft extensions to limit the movement caused by side loading that would otherwise damage the working components of the paddle unit. Shaft guards should be the same length as the extension and should always be used when the extension meets or exceeds 460 mm (18") in length.